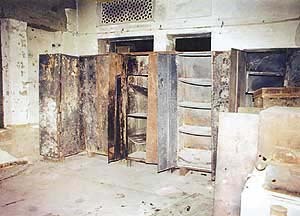 THE smoke screen resulting from the fire at the Sikh Reference Library, Amritsar, refuses to clear up even after 19 years. The repository of over 1,500 invaluable rare manuscripts, including copies of the Adi Granth, Damdami Bir (dated Bikrami 1739) and various portraits and manuscripts, the library was destroyed during the 1984 Operation Bluestar. Even after a lapse of nearly two decades, what exactly happed to the Sikh Reference Library is not clear. Conflicting statements of Defence Minister George Fernandes have not helped clear the confusion. 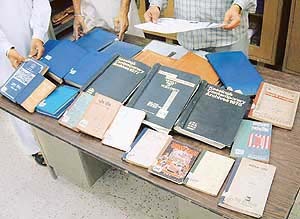 Ranjit Singh Nanda, a retired CBI inspector, had made a startling disclosure that the rare manuscripts, Hukmnamas, books and invaluable material of the Sikh Reference Library was taken in gunnybags and big trunks to an unknown place after Operation Bluestar. This had already started a controversy. Although President A.P.J. Abdul Kalam, during his recent visit to the Golden Temple, had assured the SGPC chief that he would take up the issue with the department concerned, yet the Shiromani Committee is unlikely to get back its 'treasure-house'. While the Army authorities maintain that the library had caught fire during exchange of fire with the militants who had taken shelter on the premises of the Golden Temple, the SGPC says that the Army deliberately put the 'empty library' on fire after taking the rare and invaluable material away. The Sikh reference library, besides containing rare historical books, documents, manuscripts on Sikh religion, history and culture, also had a number of handwritten manuscripts of the Guru Granth Sahib and Hukmnamas, some bearing signatures of revered Sikh Gurus, and a few rare documents pertaining to India's struggle for Independence. The SGPC alleges that after picking up the material from the library in gunnybags and transporting it to the Youth Hostel in Amritsar, a make-shift camp office of the CBI, in military trucks, the empty library was set on fire and it was made out that everything preserved there had been reduced to ashes. "But all this was nothing more than a concoction and camouflage." The SGPC says that fresh lists were prepared of the material taken from the library. The cataloguing was abruptly stopped in the wake of the Sikh convention scheduled for September 1984 and all the belongings of the library were dispatched to an unknown destination by the CBI, the SGPC alleges. Since then the apex religious body of the Sikhs, has written to a number of prime ministers in the past including Chandra Shekhar, V. P. Singh, I. K. Gujral and even the present premier Atal Bihari Vajpayee. In spite of repeated requests, the SGPC either got the reply that the "library was burnt to ashes" or "it was returned to the SGPC in compliance with the court's order." The material returned by the Army to the SGPC, it is alleged, hardly included any document of historical value. The documents returned to the SGPC comprised a few office files and passports of some prospective pilgrims to Sikh shrines in Pakistan. Some of the records taken away by the Army during Operation Bluestar were returned to SGPC by the CBI and the few of the items have been returned by Ranjit Singh Nanda , who was working with CBI at that time. All these items are intact, and in good condition . None of them look damaged by fire or smoke at all. While the CBI has returned the part of the record, it is hardly 2 per cent of the total. What happened to the rest of the material is too important to be brushed aside, or hidden behind a smoke screen. The Sikh Reference Library, Amritsar, was established in 1946 vide resolution number 822 dated October 27, 1946, of the SGPC. According to Sukhdev Singh Jhand and Santokh Singh Shaharyar, eminent Sikh scholars, the credit for establishing the library goes to the SGPC, but a significant role was played by the Sikh Historical Society, established in 1930 at Lahore under the leadership of Bawa Budh Singh. They say that though the society could not remain active after the death of its founder yet it sowed the seeds for establishing a central library, which could house the literature related to Sikh Gurus, Sikh religion and the related fields. With the result, a meeting of Sikh scholars, historians and others interested in this cause was held on February 10, 1945, at Khalsa College, Amritsar, under the presidentship of Princess Bamba, daughter of the late Maharaja Duleep Singh, the youngest son of Maharaja Ranjit Singh. The Sikh Historical Society was formed at this meeting, and its formal meet was held at Teja Singh Sammundri Hall on April 29, 1945. At this time, bylaws of the society were passed and a working committee constituted. It comprised Teja Singh, Bawa Prem Singh, Bawa Harikrishan Singh, Gurmukh Nihal Singh and Ganda Singh was set up. This society became instrumental in establishing the Central Sikh library. Later, the name was changed to the Sikh Reference Library. Ranjit Singh Nanda, a former CBI inspector, was a part of the five-member team that scrutinised the literature taken from Sikh reference library at the time of Operation Blue Star. He has spilled the beans recently. Nanda said that the CBI had taken the material of the Sikh reference library to its make-shift office at Amritsar's Youth Club where the officials of his department were desperately looking for a purported letter written by Indira Gandhi, the then Prime Minister, to Jarnail Singh Bhinderanwale. This purported letter was never found. However, Nanda said that he himself had seen some letters written by Jagjit Singh Chauhan and other leaders addressed to Sant Bhinderanwale. Manjit Singh Calcutta, a former secretary SGPC, while corroborating the statement of Nanda also alleged that the Army had set the Sikh reference library on fire in desperation when it failed to find the letter. Even as CBI officials denied that such material was still in the agency's possession, Nanda said that the material of Sikh reference library was packed in gunny bags and trunks after proper cataloguing before taking them from the youth hostel to an unknown place. These disclosures have substantiated the claims of SGPC that books and manuscripts taken from the Sikh Reference Library was still lying with the CBI. Nanda said the five-member CBI team had scrutinised each and every book and manuscript and thereafter packed them into 165 gunnybags. Each bag was numbered. The entire material was bundled into the waiting Army vehicles and taken away in wake of the crucial meeting convened by Sikh high priests at that time. He alleged that he was stunned to see a volume of hand-written Guru Granth Sahib with bullet holes. Nanda showed a letter of appreciation from his seniors which reads: "It is submitted that inspector Ranjit Singh of Punjab police who is assisting CBI team since long has rendered valuable assistance in investigation of this case, particularly during examination of documents from SGPC etc. It is therefore requested that he may be considered for grant of a suitable cash award". The letter buttresses the SGPC's claim that the CBI had taken away the material of the Sikh reference library with some ulterior motive. Nanda said that he himself handled the manuscripts and other books. In May, 2000, the Central Government, for the first time, acknowledged the claim of the SGPC that the Army had taken away valuable historical books and relics during Operation Bluestar. In a communication to the then secretary SGPC, George Fernandes said that the material is with the CBI. He suggested that SGPC should take up the matter with Union Ministry of Personnel, Public Grievances and Pensions since the CBI comes under the Ministry. This statement was widely hailed, since it was after 16 years of long communication with the Centre that the SGPC had come to know that the books were 'safe'. However, much to the dismay of the Sikh community during his visit to Jalandhar on August 17, 2000, Fernandes told the media persons that on "court orders," the CBI had destroyed as many as 117 items which were found to be 'seditious'.